The monsoon season “officially” runs through June, July, August and September. This year it was about a week late in being established and now, at the end of the season, total rainfall has been about 3% lower than the long-term average and it counts as a normal monsoon (just). Predictions of a better than average monsoon have been proven wrong . But have they? The monsoon does not much care about calendar dates and the withdrawal of the monsoon is running about 2 weeks behind its “average” schedule. 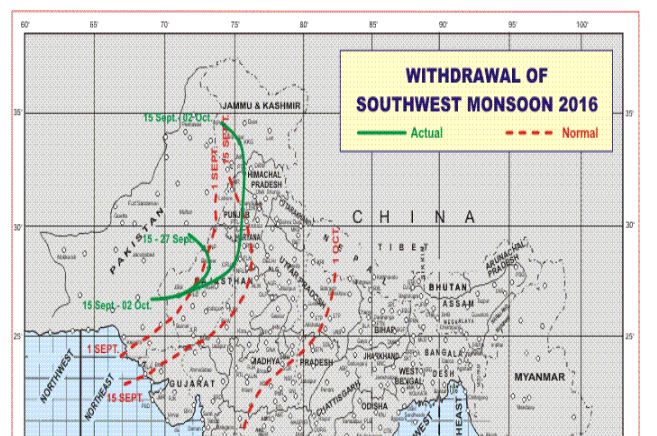 It looks like monsoon rains will continue sporadically over the next 15 – 20 days. Currently the rains stretch across central India from Gujarat to Bihar. The total rainfall – though not conforming to the official calendar – may well be slightly above average. Once it has finally withdrawn the verdict is likely to be that the 2016 monsoon was “good”. This entry was posted on October 3, 2016 at 8:15 am and is filed under Climate, India, Weather. You can follow any responses to this entry through the RSS 2.0 feed. Both comments and pings are currently closed.